A total of eight local athletes were in action in Leeds for the prestigious English Schools Cross Country Championships, the top schools event of the season. The day could hardly have gone better both for the individual athletes and the Sussex squad in general. All eight made the top-scoring six for their county, seven for Sussex and onefor Hampshire, and Sussex achieved their best overall result by finishing fourth out of the 45 counties competing, beaten only by Surrey, Kent and London and in front of powerhouses such as Yorkshire, Lancashire and Middlesex. One other remarkable statistic was that six of the eight came from one school, Bishop Luffa in Chichester, reckoned to be the highest number from a single establishment in the intermediate and senior age groups. It was a red letter day for the Sussex senior teams with the boys finishing a fantastic second with 165 points from their six athletes, just pipped by Kent for the top spot on 155. Leo Stallard from Bishop Luffa was the crucial sixth man home in 69th place, followed Worthing’s Ethan Fincham. The Sussex senior girls also did well to gain a top-ten team spot in eighth place and were led home by Olivia Macdonald from Seaford College in 27th place. Third and fourth scorers for the county were a duo of Bishop Luffa runners with Ellie Farrow 20 seconds behind Maconald in 47th and Alice Cox-Rusbridge a further 20 back in 77th. The combined efforts of the boys and girls’ seniors earned them another best-ever finish with an aggregate of 640 points, good enough for second place out of the 45 counties with only Kent, on 563, ahead. A good all-round showing from the intermediate Sussex athletes on duty gave them another two top-ten team positions. There were two runners from Chichester in the boys’ race, albeit running for different counties. Liam Dunne had the best race of his winter season to finish in 39th place less than 80 seconds behind the winner. A pupil of Bohunt School, Dunne wears the Hampshire vest in this competition and was delighted to be first Hants runner home by some distance. Fellow clubmate and running for Sussex was James Gardam, another of Bishop Luffa’s rich seam of talent. Gardam also had a good race to finish 116th and fifth Sussex scorer, helping them to eighth place. Such is the closeness of competition at these championships that Gardam’s time was less than a minute behind the first Sussex scorer in 18th. The girls’ intermediate race provided Sussex with their only winner of the day with Eastbourne’s Beth Cook keeping up her fine tradition in this event. Finishing as third and fourth Sussex scorers were another Bishop Luffa duo with Olivia Toms in 84th just getting the better of Maggie King in 89th, the pair enabling Sussex to finish as 7th team. One of the most popular and well-established road races in the south saw 1,500 runners line up for the Eastleigh 10k on Sunday with the winner Richard Allen from Aldershot & Farnham the man who won the 2018 Chichester Priory 10k. Chichester Runners were able to provide five runners inside the top ten per cent of the field and were led home by under-20 Leo Stallard in his first run over the distance, finishing a fine 19th in 33min 44sec, a time which lifts him to just outside the top 20 in the national rankings for his age group. Not far behind was John Peters who followed up his good run in the Sussex cross country championships in January with a personal best time of 34.26 in 31st place – enough for third in the veteran-40 age bracket. Another PB was gained by Keith Akerman with 38.04 in 112th just in front of Graham Woodward, 117th in 38.10. The final member of the quintet was Jason Snow, who finished just inside the top 150 in 147th with a PB of 39.03. These performances, added to the Chichester 10k and other races, give Chichester Runners ten athletes under the 36-minute barrier at his early stage in the year, a promising sign for the rest of the season. No sooner does the winter cross country season finish than the busy summer track and field programme will be getting under way for Chichester Runners & Athletics Club. 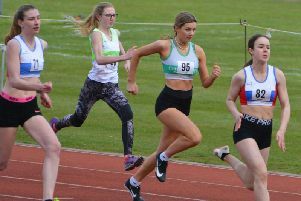 As with other sports, there is an increasing demand on the timetable to schedule in events and league matches with Chichester’s senior Southern Athletics League squad in action on Saturday April 13, just a week after the Sussex road relays have brought the winter programme to a conclusion. The seniors have one league match per month going right through to August and will have to fit in county and area championships into the schedule as well as open and invitation meetings. They open their league fixtures at Down Grange, Basingstoke and will be up against Havant, Poole Runners and City of Portsmouth. The club will also be represented in both the upper and lower age groups in the National Youth Development League with the under-13s and under-15s the first to be in action at the Mountbatten Centre, Portsmouth, on Saturday, April 27. A week later the under-17s and under-20s will kick off their campaign at Walton-on-Thames on Sunday, May 5. There are also Sussex League fixtures to look forward to with the under-13 and 15 league providing an ideal opportunity for athletes to gain experience at a more local level. This time of year is an ideal time for prospective members to get in touch as the club need a whole range of skills for all their teams – including sprinters, hurdlers, distance runners, jumpers, vaulters and throwers in all age groups. The club go back to summer training headquarters next Monday, April 3, at the University of Chichester with pre-season training and trials taking place on Mondays and Wednesdays from 6pm to 7.30pm. For more information about the club please contact Phil Baker on email - philbaker5@btinternet.com.